When you use tooth whitening products from a pharmacy or supermarket, there’s no guarantee that you’ll get the results that you’re looking for. Some products could also irritate your gums if they aren’t used properly. The better option is to have a professional take care of the job. Learn about the advantages of teeth whitening by a Waukesha, WI dentist who is experienced in cosmetic dentistry, like Dr. Robert Wyler. 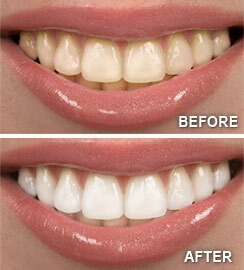 Teeth whitening done by our Waukesha dentist is a safe, effective way to brighten your smile. It's also perhaps the most economical cosmetic dental procedure. Depending on the whitening method you choose, results can be dramatic: in-office whitening, for example, can lighten teeth three to eight shades in a single hour. Professionally supervised whitening will work faster, and protect sensitive gums and tooth-root surfaces better, than over-the-counter whitening products. Having an oral exam before you begin any whitening process is an important first step to make sure your tooth discoloration is not the result of a dental condition in need of treatment. Also, please be aware that it can be risky to have whitening solutions applied to your teeth by untrained personnel in shopping malls. 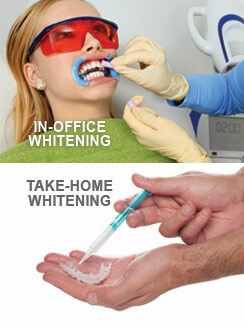 If you have any questions about which whitening method would be best for you, talk to our Waukesha dentist first. In-Office Teeth Whitening — This technique offers the fastest results with the most powerful whitening solutions available. First, your gums and tooth-root surfaces will be covered with a protective barrier to ensure your safety. A thin plastic device known as a retractor will hold your lips and cheeks away from your teeth as a professional-strength hydrogen peroxide gel is applied. The gel will be left on for about an hour. When it is removed, the results will be obvious immediately. The majority of the time you spend at your professional whitening appointment will be spent laying back and relaxing. After protecting your gums, your Waukesha dentist will gently apply a bleaching gel to the surface of your teeth and then use a laser curing light tool to activate the gel. After you relax for about an hour, the dentist will remove the gel and reveal your new smile. There are lots of things you can do to make sure your whitening results last as long as possible, and this will vary from person to person (six months to two years or even longer). First of all, please maintain your usual, conscientious routine of brushing and flossing every day, and keep up with your regular schedule of professional cleanings at the dental office. Avoid foods and beverages that stain, including red wine, tea and coffee. If you smoke, use your newly whitened teeth as an impetus to quit — a good idea in any event! A minor touch-up every so often, either at home or at our Waukesha dental office, can keep your smile bright and beautiful for years. Call Robert L. Wyler DDS, SC in Waukesha, WI at (262) 784-5757 today! Proudly serving Waukesha, Brookfield, Elm Grove, Pewaukee, New Berlin, and Sussex areas.